There was a small Christmas gathering at the Museum today with sweet and savoury nibbles and a feeling of elation still evident among those present, after last week's council vote to accept the Report recommending the building of a new Museum and Art Gallery on the site of the Wyvern car park. And a couple of photos in the downstairs room on the left as you enter the building. If you did not know about this event, it may be because I do not have your email address, if that is the case, and you would like to receive email updates, please make sure you complete your email address on this years renewal form, email me via the email address at the top of the blog, or leave it at the Museum Reception. So much has been achieved recently at the Museum and Art Gallery in Bath Road, and now instead of looking quizzically at you if you mention this, and asks where it is, everyone knows we have a Swindon Museum and Art Gallery that we're proud to proclaim. And a bleached out top of the photo, but 'MUSEUM' above the door again. The cabinet voted through the proposal that a new state of the art, purpose built museum and art gallery should be built on the site of the multi storey car park beside the Wyvern. All parties agreed this would be a real asset to Swindon, and look forward to the completion of the project which will take an estimated 5 years at least. The trip was instigated by Frameworks, an organisation which aims to bring several museums and art galleries together and encourage an exchange of views between the Friends of Bristol, Bath Holbourn, Cheltenham and Swindon museums and art galleries. There have been visits to Bristol and Bath, apologies for lack of reports on those visits, and hopefully Frameworks will run more trips. Above an embroidery designed by May Morris in the early 1890s. Jake and Dinos Chapman 'One day you will no longer be loved (that it should come to this)' 2010. This is a recent acquisition, I have included the gallery information below. The second part of the visit involved being shown around the exhibition 'Casting Brilliance: Glass by Colin Reid which runs until 5th of January 2014. The piece above is kiln cast and polished optical glass with copper patina. It is cast from rocks on a beach in Japan, and looks fabulous. This piece is called 'Cornucopia Mirror' made from Kiln-cast optical glass with copper patina and mirror. Two more pieces can be seen in the reflection. There is a film accompanying the exhibition which helps elucidate the processes. Above Henry Tonks 'Two Girls in a boat', interesting to see what he produced after reading 'Crisis of Brilliance' about the Slade artists around the time of WW1. This was a wonderful chance to look round Cheltenham's Museum and art gallery, special thanks to Kirsty Hartsiotis and her associate for making our visit so special. An exciting plan to create a cultural hub in Swindon could soon take a significant step forward. Next Wednesday (11 Dec) Swindon Borough Council’s cabinet will be asked to approve that a site off Princes Street, which would include the soon to be demolished Wyvern Theatre car park, be used to house the town’s museum and art collections in a new purpose-built facility. The site, which is next to the Wyvern Theatre, was chosen following an options appraisal by heritage specialists Barker Langham as it fits in with the Town Centre Masterplan and the Council’s Economic Strategy, which notes that a new Museum and Art Gallery would help to improve Swindon’s external image and act as a draw to businesses considering an investment in the Borough. 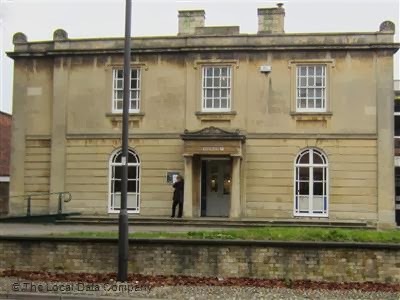 Owned by the Council, the identified location could also be used for a range of uses such as performance spaces, public realm or offices and housing. The Cabinet will also be asked to commission further detailed feasibility work for the proposed museum and art gallery within the context of a ‘cultural quarter’ that would also include a new theatre in the same vicinity. The feasibility work would also be required to identify the most appropriate business model to generate on-going revenue and capital funding to support the facility into the future. A new home for the Borough’s museum and art collections is an aspiration of Swindon Heritage Board, while a visit by HRH the Duchess of Cornwall to the town’s art gallery last year resulted in significant interest from local potential benefactors who are extremely supportive and keen to help the project. This group is being led by Robert Hiscox, Honorary President of Hiscox Insurance, who is himself a substantial art collector. Swindon has one of the best collections of 20th Century art outside of London, but, due to the size of the current Swindon Museum and Art Gallery in Bath Road, only a limited amount of the artwork can be displayed at any one time. A new art gallery and museum would meet a number of objectives set by an advisory group which has been overseeing the development and delivery of the work by Barker Langham. These include maximising the regeneration and economic benefits for Swindon, enabling the current collections to grow and become world class, to generate cultural tourism and to ensure a positive and sustainable future for the collections. If the Cabinet support the recommendations the Council will also apply for financial support for the project from the Heritage Lottery Fund. Cllr David Renard, Leader of Swindon Borough Council and chairman of Swindon Heritage Board, said: “I am really excited that our long-held ambition to find a new home for our superb art and museum collections is starting to take shape. Cllr Garry Perkins, Swindon Borough Council’s Cabinet Member for the Economy, Regeneration and Culture, said: “The site identified in the cabinet report ticks a number of boxes but the fact that it ties in with our Town Centre Masterplan is very important. Robert Hiscox added: “The Swindon Museum and Art Gallery has a fascinating collection of Modern British and Contemporary Art, but the collection deserves a better home and it is inspirational that the Council, the politicians and local people have united behind the vision of building a new one. “A new museum and art gallery would bring a cultural vibration to the heart of Swindon and be a vital part of its regeneration and a great asset to the whole region”.